I never imaged that making pickles could be so simple. I thought there was canning and tongs and boiling water involved. 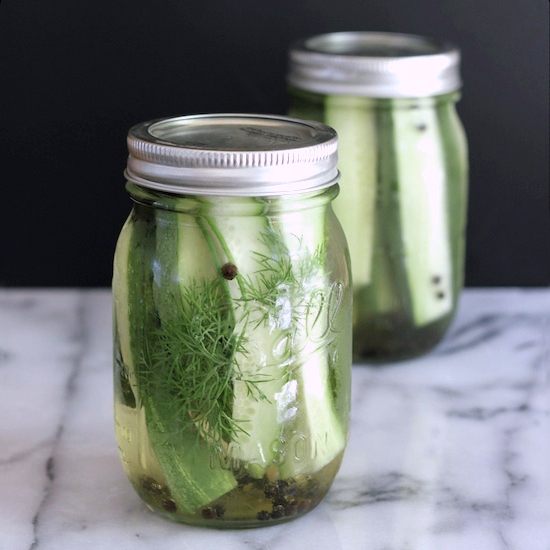 Making these quick pickles couldn’t be easier. You just trim them to size, add in some spices and herbs, cover with a vinegar brine and put them in the fridge. That’s it. The hardest part was waiting the 48 hours to eat them. They are crisp and crunchy and fresh tasting. I added black peppercorns, garlic and fresh dill to each jar. You can add any spices that you like. Love a strong dill taste then add more dill. Like your pickles spicy then add some red pepper flakes or hot chili peppers. Love garlic then add more garlic or chop up your garlic for more garlic power. These quick pickles are so easy you can experiment by adding different spices and herbs to each jar if you want. I used 6 cucumbers but the amount of cucumbers will vary depending on their size. I have a couple of cucumber plants growing in the backyard and usually pick the cucumbers when they are around 6 inches long. If you’re using store bought cucumbers your cucumbers will probably be a lot bigger – so you’ll need less cucumbers. You need to wash your mason jars and lids with hot soapy water and then let air dry before filling. Don’t use table salt. The first time I made these I used table salt and whoa were they salty. So please use kosher salt for this recipe. I measured the height of the jar and then trimmed the tops and bottoms of my cucumbers so they would be the right size to fit in the mason jars. Pack the jars tightly with cucumber spears and then add your spices. 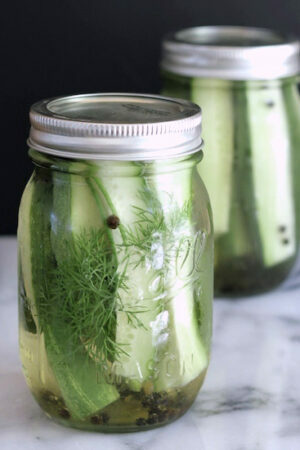 I tucked the garlic and dill in among the cucumber spears and then added the peppercorns to the top of the jar before adding the vinegar brine. No need to boil the vinegar, salt and sugar combination. Just put it in a large jar or large measuring cup and stir briskly until the salt and sugar has dissolved. There will be a bit of extra vinegar brine left after you fill both jars. I wanted to make sure there was enough brine to fill the jars completely without a problem. These quick pickles definitely get better the longer they sit in the fridge. You can eat them the next day but I think they were best after 48 hours. They should keep for at least a couple of weeks in the fridge. Adapted from this Food & Wine recipe. Quick Pickles. Crisp, fresh and crunchy. Couldn’t be easier to make. Wash 2 1-pint mason jars and lids – wash with hot soapy water and air dry. Stir together vinegar, kosher salt and sugar. Stir until salt and sugar are dissolved. Add 2 cups of water to the vinegar, salt and sugar mixture. Add the cucumber spears to the 2 mason jars. You’ll need to trim the top and bottom of the cucumbers off so they fit snuggly in the jar. You want to completely fill the jar – so pack those slices in there. Slip in to each jar – one garlic clove, 4 sprigs of fresh dill. Add 1 tbs of black peppercorns to the top of each mason jar. 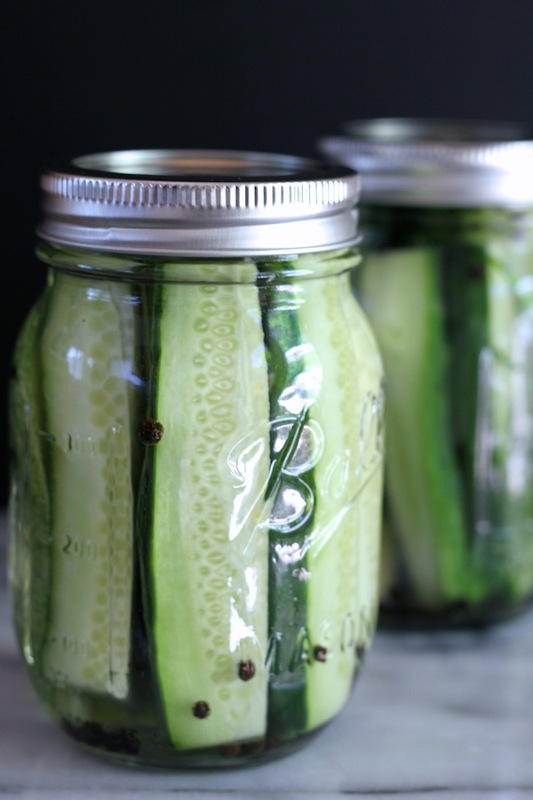 Pour vinegar brine into each mason jar, fill the jar up so that all the cucumber spears are covered with the brine. Screw on the mason jars lids, tap the jars lightly to release any air bubbles and put the mason jars in the refrigerator. Wait at least 24 hours – 48 hour is better – and open up the jar and enjoy a quick pickle! Assuming we don’t eat the whole jar (and we made 6 with the brine recipe since we have sooooooo many cucumbers), how long will they last for. Do they go off? Are they better after a week or two or best eaten after 48 hours. Hi Rachel – sorry for the late reply – I’ve been away for the holidays. These will last a week or two in the fridge with no problem. Hope you enjoy them. These are great. I’m curious however, why do most of the quick pickle recipes have instructions to boil the brine? I’m not sure, Jay. This recipe does not need to boil the brine – so it’s super easy to make. Hope you try it. Does the added sugar make it sweet? We do not like sweet pickles in our house. Hi Janice – the brine is not sweet. Hope you enjoy them. I’m an American Soldier living in Italy. It’s fennel season here, so I jusr adapted your recipe. I’ll let you know in a few days how they turn out. Hi Leonard – fennel will be an interesting addition since it has a licorice-y taste. Definitely update me if you can – hope it turns out great. Thanks for leaving a comment – have a good one! Hey Anne – I’m thinking of pickling zucchini next! I’m so inspired! 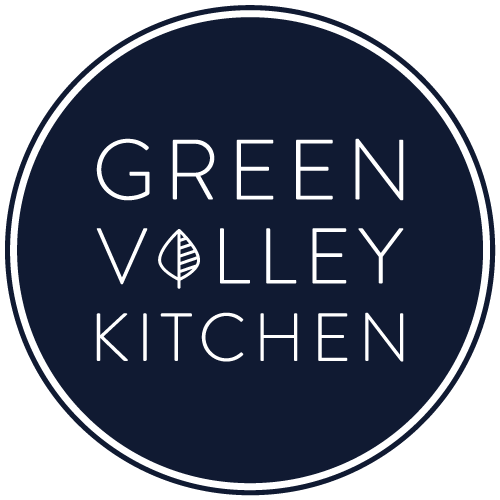 Thank you for the detailed recipe and notes. This is the very thing that makes this time of year so much fun! It’s pickle time! I love that this is a small batch recipe, too. I usually buy all the pickles that the farmers market has because where I live, they are only available for a very short time. Then I have too many pickles… more than I can fit into my pantry (although they do make great gifts). So this is perfect for me. Much more manageable. Thank you, Geraldine! You’re going to love these, Traci. They were sooo easy to make. Every time I went by the fridge I had to eat one :). I can’t wait to make them again. Do you not heat the brine? Hi Dylan – no need to heat the brine. Just stir the vinegar, salt and sugar together until the salt and sugar dissolve then add the water – that’s all there is to making the vinegar brine. It’s so easy! I love pickles. I can literally eat them by the jar! Thanks for a wonderful recipe! That’s what I did – ate the whole jar! The second jar I took to work for friends to try and that was gone in a flash. You’ll love them!